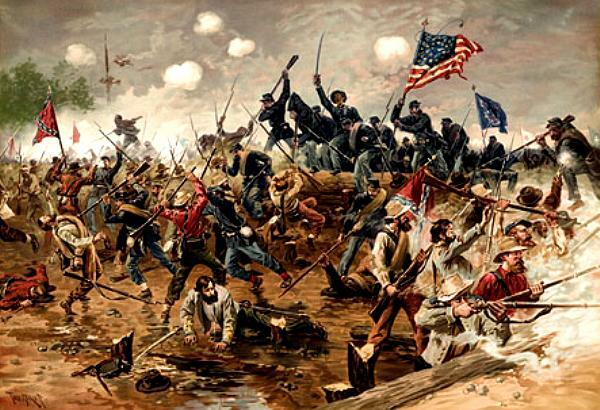 The American Civil War took place between 1861 and 1865. We are upon the 150th anniversary of the conflict and over the next five years those interested in that war and its consequences will find much to read and watch. Baptists, particularly, may be interested in "Baptists and the American Civil War: In Their Own Words", a site created by Baptist historian Bruce Gourley. A quick review of the material already on the site shows a concentration on the experience of Baptists in the American South. Baptists in the South during the Civil War-era were unequivocal: Secession, the Confederate States of America and the Civil War were primarily about slavery. Foreshadowing the Civil War, white Baptists in the South withdrew fellowship from their northern counterparts on May 10, 1845, in order to better defend the South’s practice of black slavery. The denominational schism did not happen in a vacuum. Whereas prior to the 1820s, many Baptists North and South were anti-slavery, by the mid-1840s Baptist sentiment in the South – at least as expressed in denominational leadership – was of the consensus that the enslavement of blacks was ordained of God and must be defended. .... Renowned Baptist preacher and denominational leader Richard Furman, while president of the South Carolina State Convention of Baptists in 1823, wrote on behalf of South Carolina Baptists to the governor of South Carolina about slavery. His letter, a response to an attempted slave uprising the previous year, is considered a watershed event in the beginning of a movement toward consolidation of white Baptists in the South to the pro-slavery position. Seventh Day Baptists had no churches in the deep South until some time after the Civil War [the farthest south churches were in what became West Virginia] and the denomination was not riven by the issue of slavery. Like most northern Baptists, Seventh Day Baptists were largely abolitionists. Information about Seventh Day Baptists, slavery, and the war can be found here, here, and here. Didn't Lost Creek suffer some because some members were slaveholders? I remember reading about it, but don't recall details without looking in the "big green book" . . .
A member of the Lost Creek church [in western Virginia - a slave state] inherited two slaves, an elderly woman and a boy who was considered simple, if my memory serves. I believe both slaves were also members of the church. The fact that the Lost Creek church had as a member, a slaveholder, caused others in the denomination to denounce them, but calm was restored when the circumstances became clear to all.